By The Grace of God — When We Said “I Do”Through The Lens of David Collins	By The Grace of God - When We Said "I Do"
It’s unbe­liev­able how fast time flies by, espe­cial­ly when you look back to impor­tant dates in his­to­ry. All of us will for­ev­er have etched in our minds where we were, and what we were doing on Sep­tem­ber 11, 2001. Anoth­er date etched in my head was on Octo­ber 28, 1985. For most every­body that date doesn’t mean a thing, but for me, it was the begin­ning of my life being mar­ried to my best friend whose name is Tami. She is my soul­mate and my gift from God. With­out God being the cen­ter of our mar­riage, we would have nev­er made it. We made our vows between the two of us, and to God who joined us togeth­er. We vowed to love each oth­er, for­ev­er. We vowed to be hon­est, patient and for­giv­ing. We vowed to stick with each oth­er, through sick­ness as well as health, if we were rich or poor, until we are part­ed by death. Being, hon­est, patient and for­giv­ing was the easy part of our mar­riage. In the 30 years we have been mar­ried we have nev­er had a big fight We have nev­er raised our voice to each oth­er. We have had some dis­agree­ments, but it nev­er last­ed more than an hour before we worked things out. We have above all, respect­ed each oth­er and always con­sid­ered each oth­er a gift from God. Now don’t get me wrong, there were huge strug­gles to over­come. Mon­ey in most mar­riages is a big issue, but mon­ey was nev­er an fight­ing issue, we always knew if we could spend or couldn’t spend, and there were many years that we couldn’t spend. We have made it through the rich­er or poor­er part of our vows by the grace of God, lit­er­al­ly. The hard­est thing we had to deal with in our vows was the sick­ness and health. Tami, this vibrant, out­go­ing, friend to every­one, type of per­son was over­come by headaches and bad doc­tors that land­ed her in bed the major­i­ty of our thir­ty year mar­riage. Again, by the grace of God, she is well and being that vibrant, out­go­ing per­son I said my vows to so many years ago. The glue that holds us togeth­er is Jesus above, and our undy­ing love for each oth­er. I do believe in God, and that He does answer our prayers. It might not be in our time frame, but He does answer prayers. He doesn’t car­ry a watch, but He does how­ev­er want us to wait on Him. He wants our atten­tion, and He wants us to depend on Him alone. In our mar­riage, we have trust­ed God, and by His grace he has blessed our mar­riage and kept us strong. Tami, it was 30 years ago that I said “I Do”, and with every­thing we have been through, I would say it again, “I Do”!! Tami, you are my best friend, I am so in love with you, now and forever­more. 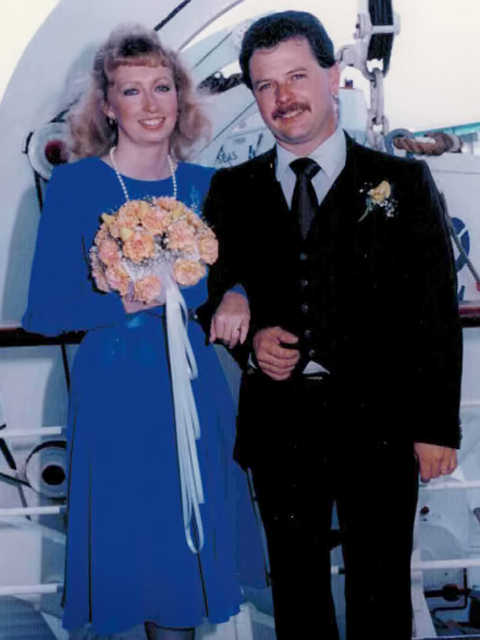 We weren’t mar­ried in a church, but on a cruise ship which we were allowed to board two hours ahead of every­one else. We set sail to Ense­na­da Mex­i­co 4 hours lat­er. The cap­tain of the Queen Mary, an ordained min­is­ter, mar­ried us. Nei­ther of us had any fam­i­ly mem­bers at our wed­ding, only friends. It was eas­i­er as we had both been mar­ried before and our fam­i­lies lived in dif­fer­ent states. We had a wed­ding crash­er that we noticed in our pic­tures and not before then. I won the cruise sell­ing Rain­bow vac­u­ums. I did not meet Tami’s par­ents until after we were mar­ried. I got lucky! They liked me! We met at our mail­box in our apart­ment com­plex where we both lived in. We stood and talked there for an hour. I gave her flow­ers each month for an entire year. She IS my best friend that I am so in love with, now and for­ev­er! By the grace of God, we’ll make it anoth­er 30 years!!. This entry was posted in Stories of David & Tami and tagged David & Tami, Wedding. Bookmark the permalink. Beau­ti­ful­ly writ­ten life sto­ry. Your love for God and each oth­er is con­fi­den­tial­ly shown in every word and pho­to. Inspi­ra­tional! What a great write-up! Con­grat­u­la­tions & Bless­ings on your thir­ty years of mar­riage. Hope you are hav­ing a won­der­ful get-away. What a beau­ti­ful trib­ute to endur­ing love! Hap­py anniver­sary to both of you! My ring­tone on my i-phone for when Bill calls me is a Clint Black & Lisa Hart­man song called “When I said I Do”. This post made me think of that song. I ded­i­cate that song today to you!!!! ?? P.S. I just sent you the song. ?? Ah, Thanks Sandy!! We both know the song well.